In the past few years we've invested more than $50 billion in electricity infrastructure -- new dams in the south, new towers in the north, $13 billion to refurbish nuclear power plants alone and billions more to ensure new transmission and distribution lines everywhere. These are enormously important assets that meet the demand for cleaner and reliable power everywhere in the province. These are assets that belong to all the people of Ontario and that will serve us for many decades to come. We needed to rebuild the system and so we went to the bank for that money. But the terms that were set weren't fair -- particularly the amortization. Instead of paying off the mortgage over 30 years, we agreed to a term of 20. 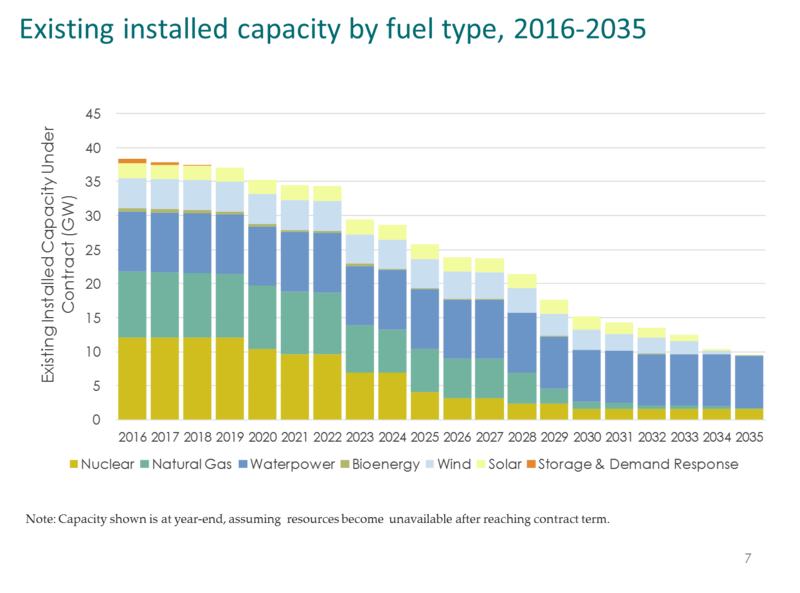 To ground the information on some fact, I'll start with slide 7 of an IESO presentation accompanying the Ontario Planning Outlook delivered in September 2016. 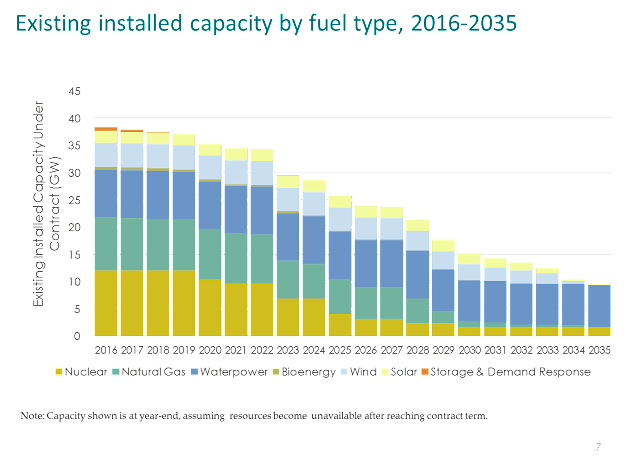 The chart shows currently operating capacity (likely as of the end of 2015) still anticipated to be "under contract" in 2035: most is hydro, and most of that is publicly owned OPG's generators. Adding recently re-contracted Mattagami sites to OPG's 100% public generators explains 94% of the waterpower shown for 2035. The nuclear showing in 2035 is Bruce Power's refurbished units 1 and 2. I've now explained 93% of all the generating assets that were in service (likely at the end of 2015) that will remain "under contract" by 2035. Of the contracted sites, Bruce nuclear reactors are contracted for an expected 31 year life, and the Mattagami waterpower sites have 50 year contracts. Of the generation assets that will still be under contract or owned in 20 years, most were built by generations that preceded the Premier's, and those that don't already have longer payment periods factored into existing contracts. According to official data, last year the waste proportion of these regions were Gansu (43 percent), Xinjiang (38 percent), Jilin (30 percent), Inner Mongolia (21 percent), Heilongjiang (19 percent). However, close to 50 billion kilowatt hours of wind power was wasted, up from 33.9 billion kilowatt hours a year earlier, due to distribution of wind resources and an imperfect grid system. In Ontario, the IESO doesn't seem as advanced as the Chinese NEA so is yet to release an official curtailment figure, but I've got estimates! Starting this summer, electricity bills will be reduced by 25% on average for households across Ontario. Many small businesses and farms will also benefit from this cut. And bills won’t increase beyond the rate of inflation for at least four years. People who live in eligible rural communities and those with low incomes will see even more reductions to their electricity bills. Taken together, these changes will deliver the single-largest reduction to electricity rates in Ontario’s history. I found none of the government's posted material informative. Introducing a First Nations electricity rate. The move to fixed delivery charges is one I approve of, but it may be of limited interest as it impacts individual consumers (the higher consumption user, including farms, benefit at the expense of low consumption residences). In the remainder of this post I'll pull some evidence together to speculate on how the government intends to reduce the global adjustment charge by 20 per cent, and the implications of doing so.